Putt-putt — miniature golf, right? So, I learned two things this weekend, Adam Scott is the first Australian to win the Masters, and “putt-putt” golf is a brand of miniature golf, not a generic designation for a type or category of golf game. In fact, I was surprised to learn that the brand is subject to federally-registered trademark rights, and for much more than mini-golf services, see here, here, here, here, and here. In the Putt-Putt v. 416 Constant Friendship decision, the court granted summary judgement in favor of Putt-Putt’s federal and Maryland State trademark infringement and unfair competition claims. The court basically found it unnecessary to hold a trial in order for Putt-Putt to win. Not only did the court find there to be infringement as a matter of law, it also found Putt-Putt to be a “strong” trademark. Why the surprise? I grew up using and hearing the term as a generic reference, not a brand. Apparently 416 Constant Friendship couldn’t muster up enough evidence to even create a genuine issue of material fact on the question of validity. Survey evidence would have been interesting, but there was no mention of this type of evidence, the registrations appeared to carry the day on validity. I’m surprised too. And it’s a little troubling, as Steve seems to be saying, that the issue was decided on summary judgment. Just as I said about the purported trademark for “ping pong” years ago, yes, you can have a trademark registration, so technically speaking you have a trademark unless and until someone pushes back in front of a judge or a jury, or both. In the case of ping pong, which is what everyone calls table tennis, I am certain that if that happened, that registration would be history. So as I say, like Steve, I would have thought the same thing regarding PUTT-PUTT. So what exactly did happen in that case? It’s worth looking a closely at the opinion. For one thing, it doesn’t appear that Putt-Putt, LLC was looking for trouble here. This lawsuit was evidently not born of a cease and desist letter or some sort of enforcement campaign, but rather a trademark registration application by the defendant, 416 Constant Friendship LLC, for the mark “PUTT-PUTT FUN CENTER” for, well, miniature golf type stuff. This terms is, as you can see on the screen shot above, how Putt-Putt brands its fun centers. This brilliant move was made on March 5, 2012. Dude. Putt-Putt didn’t only already have half a dozen PUTT-PUTT trademarks, i.e., the ones Steve links to. 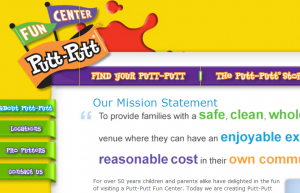 Putt-Putt had itself filed trademark application a month earlier for the mark … yes — PUTT-PUTT FUN CENTER — which was published for opposition the next July and added to the Register on October 9, 2012. Shortly after the cancellation of the franchise agreement, the [franchisee] lost possession of the above-mentioned property. Through later foreclosure proceedings, a different entity, P.D.A. LLC, came into possession of the property located at 416 Constant Friendship Boulevard. The business presently operating at the address [which evidently succeeded to ownership of the property] features signage using Putt-Putt’s federally trademarked terms and designs, including a cartoon miniature golf ball character named “Buster.” . . . So: There had been a Putt-Putt miniature golf course at the location. The business, it appears, tanked — as did many miniature gold courses during the recession — and stopped paying franchise fees. Defendants then bought the property, which contained, viola!, a miniature golf course. A branded miniature golf course. That’s why they bought it. Now, they shouldn’t have assumed they could use it in that form. They did assume that, however. This was error. Now, to Steve’s question as to whether a case could be made to rebut the presumptive strength of the registered mark: Maybe it could have, but it wasn’t even seriously attempted here. The opposition to Putt-Putt’s summary judgment motion, as well as examination of the docket, indicate that the main defense was, “Who, me?” That didn’t seem to fly. The argumentation with respect to the trademark issues amounted to a genericness argument, based not on survey evidence or even anything particularly substantive (or, it seems, admissible) — just printouts of a handful of web pages. Defendant’s argument fails as a matter of law as laches is a personal defense that could only be asserted by the Mottley Group. See Sweetheart Plastics, Inc. v. Detroit Forming, Inc., 743 F.2d 1039, 1046 (4th Cir. 1984) (“While abandonment results in a loss of rights as against the whole world, laches or acquiescence is a personal defense which merely results in a loss of rights as against one defendant.” (citing 2 J. Thomas McCarthy, McCarthy on Trademarks & Unfair Competition § 31:14, at 587 (2d ed. 1984))). Because 416 CF cannot avail itself of another party’s defense of laches, the Court will proceed to analyze Putt-Putt’s claims. Which it did, and, essentially dealing with what amounted to a substantive default by the defendant, the court had no difficulty holding up the validity and strength of the mark. It left its branding in place after the termination of its franchisee. That’s what got Putt-Putt in the rough in the first place. I’ve written about this before, and wondered why companies with strong trademarks are not vigilant about removing the vestiges of those marks from facilities at which they are no longer providing their products or services — what I call “ghost branding.” This question is particularly compelling with respect to franchises, which are not merely changes in leasehold; the trademark user is a third party and usually either couldn’t care less about how the vestigial branding issues affect the markholder or seeks to benefit from them by continuing a similar business in place. Here it’s not so much to wonder, I suppose. The miniature golf business, after all, was way below par. Who wants to spend more money on affirmatively de-branding a former location when it’s already stopped being a revenue source for who knows how long? Yeahbut: Fine, but please, don’t tell me about “brand equity,” if that’s how you’re going to be. You’re showing me your brand equity is calculated at zero at these moments. And that’s not just with respect to dying businesses; I asked a former Texaco trademark lawyer, in fact, about the tepid de-branding efforts I’ve observed concerning that company — an issue I also once wrote about, in fact, after reading another Steve Baird piece that discusses that very question. She admitted I was onto something, sheepishly stating, however, that it was not “legal’s” job to follow through on that. 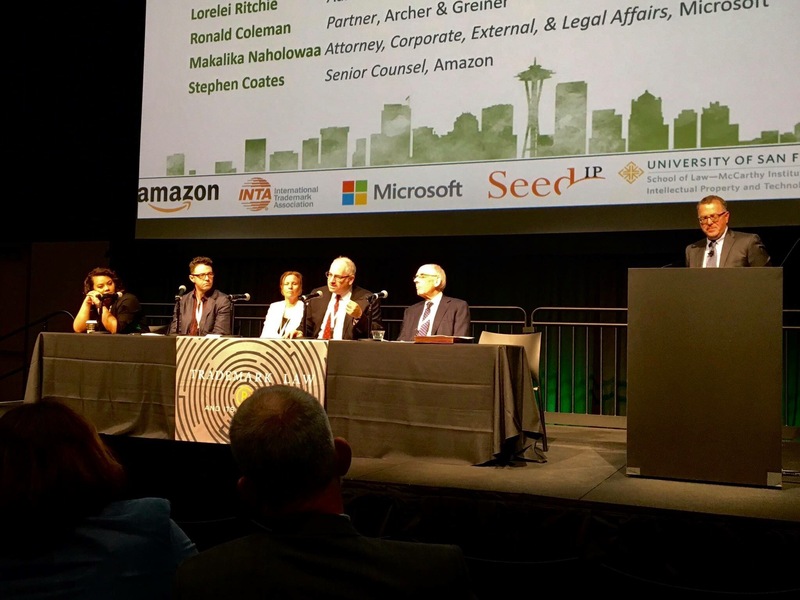 And what happens when you end up having to hire, of all firms, IP powerhouse Kilpatrick Townsend & Stockton — out of the DC office, no less — no overkill here! — to file a lawsuit, chase around a bunch of small-time defendants, prepare a motion, send a legal secretary down to the site to take pictures and swear that, yup, that’s our stuff … what did that run you, Putt-Putt? More than the cost of two guys with a pickup and a ladder for half a day plus gas and tolls to rip up a bunch of signs? What are the chances that there’s a policy over at Putt-Putt not to let that happen again and to do affirmative-debranding rather than have to fork over, what, $35,000 (I blush at my own naivete, I know) to the GC’s buddy over at Kilpatrick, since de-branding of franchisees is not his bailiwick? Actually, now that I think about it, maybe I’m beginning to understand this “brand equity” stuff.